Before you get to the decision making process of whether you should migrate your Joomla 2.5 website to Joomla 3.1, you will need to do some “homework” about what you currently are using for your website hosting, your website template, and the extensions that you are using on your website. Some of the changes between Joomla 2.5 and Joomla 3.5 are in the requirements of the hosting environment you will need to be able to have a Joomla 3.1 website. PHP minimum requirement for Joomla 2.5 is 5.2.4+, with Joomla 3.1 the minimum requirement is 5.3.1+. With Joomla 3.1 “Magic Quotes GPC” must be “off” for you to be able to install it on your hosting server. 2 new Databases are available with Joomla 3.1 that were not previously available with Joomla 2.5 MSSQL and PostgreSQL can be used for database if you are using windows hosting. Most hosting companies that currently support Joomla 2.5 hosting on their servers will already be capable of hosting a Joomla 3.1 website on your same server. Best thing to do is consult your hosting company’s technical requirements for your server hosting plan to see if your server is ready to have a Joomla 3.1 installation on it. If you are not sure, please consult your hosting company’s technical support documentation, or place a support request ticket with your hosting company about any questions you may have about hosting a Joomla 3.1 website on your server. You will need to find your template name and find out which company/developer created the template you are using on your current Joomla 2.5 website. To find this information about your template, you will need to log into your Joomla 2.5 administration. Once you are logged into your administration backend, go to the “extensions” menu, then “Template Manager” to view a list of your templates you have installed on your website. Click on “Templates” on the top of the “Template Manager” and this will show you the “Author” of the template you are using. Once you know the Author of your template, you will need to visit their website to see there is a Joomla 3.x version of your current template. 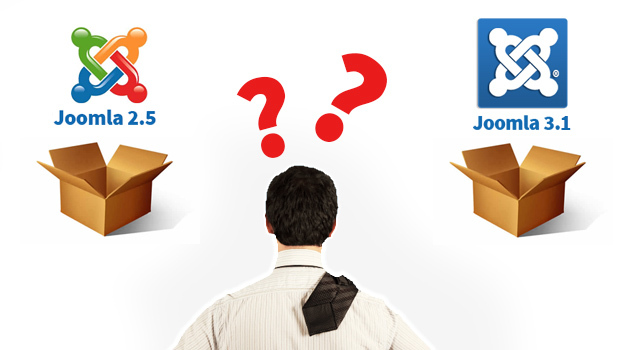 If there is a version of your template available, download the Joomla 3.x version. If there is no Joomla 3.x version of your template, you can contact the Author to find out if they are planning to release a Joomla 3.x version of your template. Once you have the list of the extensions you are using on your Joomla 2.5 website, you will need to go to each extension developer’s website (or the Joomla Extension Directory) to see if there is a version of that extension that will work with Joomla 3.x. If the extension developer does not have their extension available for Joomla 3.x, you can inquire about whether they are planning to release a Joomla 3.x version of their extension. If the extension developer is not going to release a Joomla 3.x version of your extension in the near future (or not at all), you will to find another extension that will replace your extension that you are using with your Joomla 2.5 website. Once you have gathered the information about your current Joomla 2.5 website, you will need to compare that information with the requirements for a Joomla 3.1 website. If any of the necessary parts (hosting, template, or extensions) are not ready for Joomla 3.1, you will not be able to make the move to Joomla 3.1 without meeting the requirements for a Joomla 3.1 website. In most cases, you will want to wait until Joomla 3.5 comes out before you decide to update your website from Joomla 2.5 With the new features of the Joomla 3.x CMS, it probably would be good thing to download a copy of it, install it on your local computer, and start using it. That way once you do make the decision to move to the Joomla 3.x you will already be familiar with the software and the updated features in it. Remember, when in doubt “Make a Backup”!